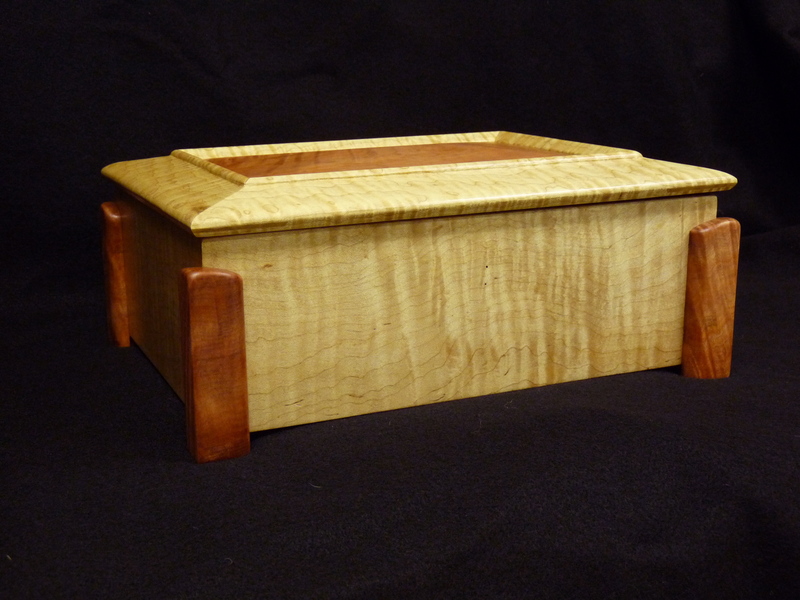 I got a commission last year to build a jewelry box for a customer to give to his wife for X-mas. I was planning on following my previous earring box design, using a red malle burl for the lid, instead of spalted maple. I was going to start work on it as soon as the semester finished up, leaving me plenty of time. Of course the best laid plans, etc., etc. During finals week, I came down with the flu and even after I shook the major symptoms, I still had the lingering blahs. I tried to do what I could, started to pick out the wood, and got so far as to shape the red malle lid. It was a turning block that had developed some major checks in it, so I had to change the shape of the design. While milling the cherry for the sides, I kept on running into boards that, after planing, didn’t really look that good; definitely second quality. Also, the adapted design didn’t seem to be working, it just didn’t seem right. This, plus the blahs, plus the cold workshop (which, if I kept the overhead space heater on, got it up to a balmy 40°), plus the other presents I had to make, and the rapidly approaching deadline, led me to an unpleasant, but unavoidable conclusion. I emailed the client to let him know that I didn’t think I would be able to finish on time, with anything that would be worth giving. Luckily he was understanding (I had told him early enough so that he could make other arrangements), and made a new deadline of March 30th, their anniversary. Cut to the beginning of March. The weather had turned unseasonably warm, I had shaken any lingering effects of the flu and had come up with a new design using the aborted red malle lid in a new way with curly maple instead of cherry. Everything seemed to flow. The design felt right, with each step in the build, I was able to figure out the best way to tackle it, and the execution was coming easy. (Oh there were still a few hiccoughs along the way. After finishing, when I went to put the hinges back on for the last time, I had to try four different orientations before finally getting the screws holes to line up on every leaf.) I got the jewelry box finished and shipped with days to spare, resulting in a happy client, and a happy Acorn House. Creativity, like invention, may be 1% inspiration and 99% perspiration, but that 1% is critical for any new work. (And, its tough to perspire in a frigid workshop!) Inspiration can be a fragile creature at times, but when its feeling up to snuff, watch out! What a difference, indeed. It may need more than 24 hours sometimes, but you’ll know when its enough. This entry was posted on March 25, 2012 at 10:19 pm and is filed under Acorn House. You can follow any responses to this entry through the RSS 2.0 feed. You can leave a response, or trackback from your own site.